But all streams of Indian music are nevertheless popular here also though alien influences of musical traditions like distorted western pop and others have crept in. But these trends will die their own death and the Indian classical arts will flourish in invincibility, adds Singhvi in chaste Urdu and Lukhnavi andaaz. Born and raised at Jodhpur, Singhvi was in the early tutelage of `A0Pandit Kshirsagar of the Gwalior Gharana. Trained in Hindustani vocal classical, she pursued a Visharad course at the Bhatkhande Sangeet Institute, New Delhi. She also imbibed the finer nuances of other gharanas, having learnt from Mujahid Hussain Khan Saheb of the Rampur Seswan Gharana, Shanti Hiranandji, Anjali Banerjee, Begum Muneer Khatoon of Allahabad, besides Ustad `A0Iqbal Ahmad Khan of `A0the Delhi Gharana. 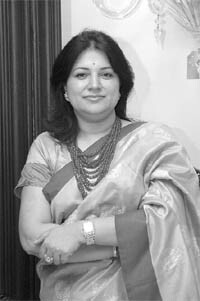 Married at the age of 18 to Manu Singhvi, an advocate, the classical vocalist and poetry- loving Singhvi acquired a special flair for ghazals and today she has to her credit over 250 ghazal and sufiana concerts performed the world over, including a few in India and Pakistan. Rightfully honoured with many titles, including the Mallika-e-Tarranum, she is a diehard follower of the legendary Begum Akhtar in terms of the style and spirit of the ghazal genre. Singhvi has five music albums to her credit, from the maiden offering Naqsh-e-Noor, Sada-e-Sufi, Tallazli to Zahe Naseeb with Khayyam as the music director. On her transition from ghazal to sufiana music, she says both genres are an embodiment of the blissful husn or ishq, pure love or the process is like ishq-mazazi transcending into ishaq-haqiqi. One needs to be blessed with a noble mind and soul, perfect annihilation of the ego and the zeal for complete surrender. The ghazal is the ultimate in lyrical expression and can best be relished by delving into the depth of meaning and is not for the superficial mindset, asserts Singhvi. "Believe me, I had to study a lot in Urdu and Persian to do justice to my renditions in terms of an absolutely perfect enunciation, which matters a lot in ghazal," she adds. Besides, I am choosy about the lyrics and sing only the poetry of Ghalib, Mir, Momin, Faiz, Dagh, Sarmad, Amir Khusro, Fani , Rumi and some of Bulleh Shah, as I `A0am in the process of mastering chaste Gurmukhi. Though I have won admiration from music lovers across the world, I am still a student yearning for perfection in emulating my idol Begum Akhtar." "Ghazal singing is certainly not a pasttime but a serious, venerable art, says Singhvi, paying rich tributes to departed ghazal king, Jagjit Singh, whose gayaki used to still the flow of time. I will be paying a musical shradhanjali to the great ghazal maestro at a concert to be held at the Awaane Ghalib Institute, Delhi, on November 12 and also at another tribute being organised in London by Pandit Vishwa Parkash shortly." She rues the absence of ghazals in present-day film music, as also the absence of competitions of ghazal singing on TV reality shows. Parting with a couplet, she recites, "Vohi shabaab ki batein, vohi shabaab ka rang/ Tujhe aie riyaaz budhape mein bhi jawaan hote dekha..."